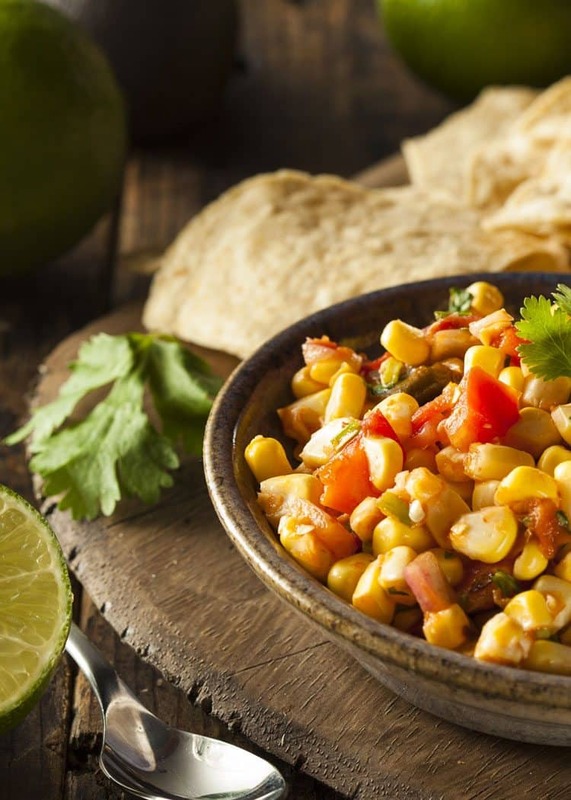 We’re huge fans of copycat recipes, like this Copycat Chipotle Corn Salsa. It is so fun to be able to make your favorite restaurant meals right in the comfort of your own home. And the reason we share so many of them–besides the fact that we love them–is that our readers keep asking for more of them! Check out all of the copycat recipes on All She Cooks. Sweet and savory with the perfect amount of heat, this salsa is a crowd favorite. We like to add a Roma tomato when we make this recipe at home, because we are huge tomato fans. 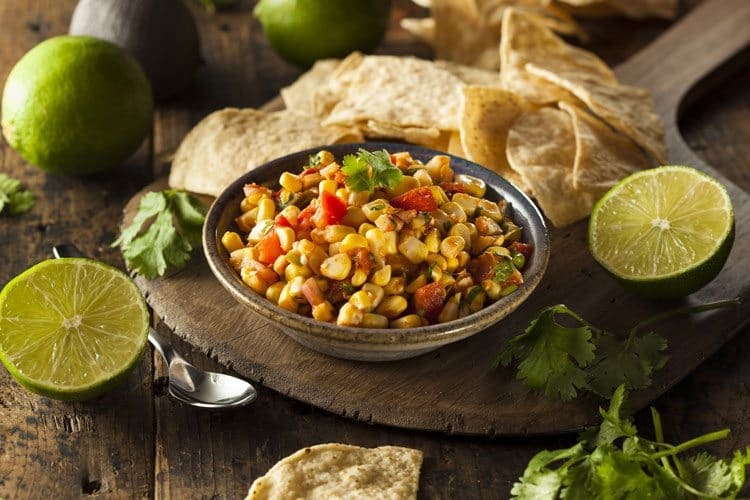 Side note– if you like corn salsa, you will love our Black Bean Salsa. You can pair either of these salsa recipes with Chicken Enchiladas for a delicious homemade dinner. Easy peasy. Making appetizers to bring along to a party should be easy and result in something absolutely delicious. 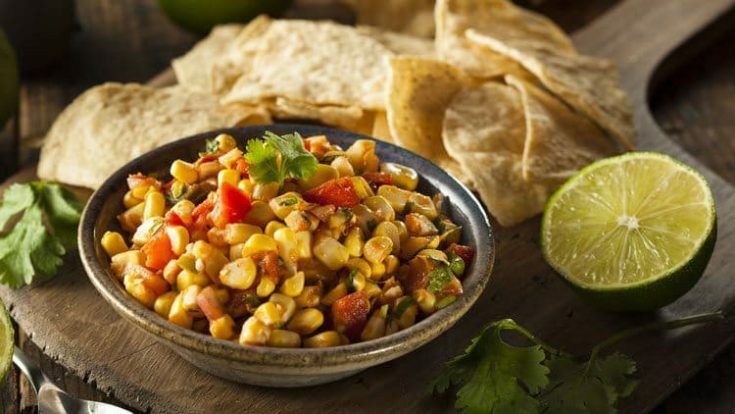 Corn salsa is a hands down winner every time. Scoop this salsa up with chips and you have an easy appetizer finger foods winner. We love using disposable appetizer dishes when bringing food to a party, because then we can leave it there and not have to worry about getting a dish back. When serving appetizers at home, its fun to serve in appetizer cups so people can easily grab a serving. Enjoy corn salsas with your favorite tortilla chips, or use as a topping on some of your favorite recipes, like our Black Bean Enchiladas. 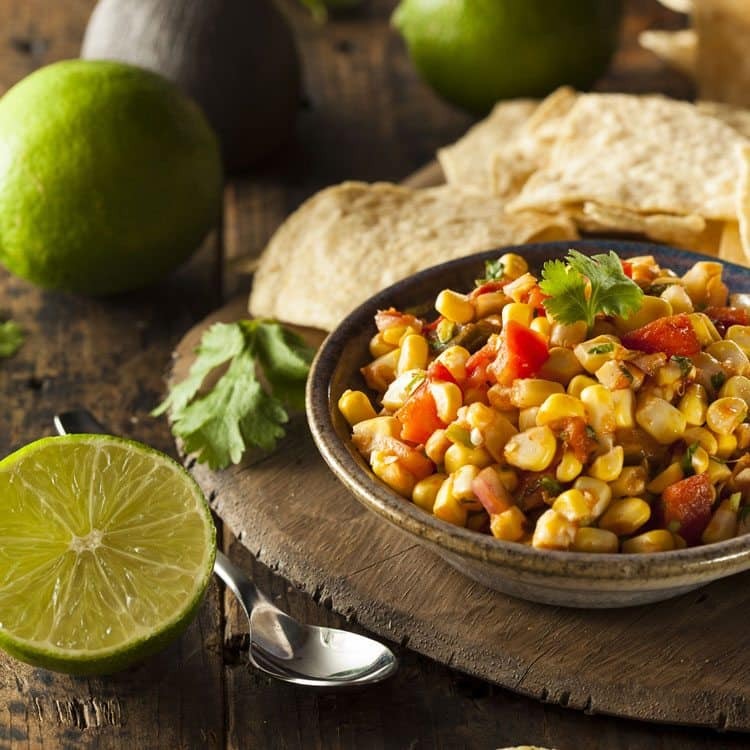 This chipotle corn salsa recipe works perfectly as a topping for salads, a delicious addition to sandwiches and wraps, and a perfect garnish on all sorts of entrees. Corn Salsa is a fabulous side dish or appetizer. It's a healthy and flavorful topping for chips, meat and many other dishes. Cut the poblano chili into two and remove the seeds. Brush with olive oil inside and out. Broil at 400 F for about 5-10 minutes. Remove chili from oven/broiler and let cool. Peel the skin and chop it. Chop red onion, jalapeno peppers, and cilantro. Ohhh thank you for this! The corn salsa is my favorite part of Chipotle.